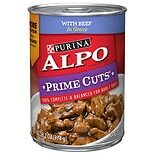 Shop Purina Alpo Prime Cuts Homestyle Dog Food Beef (13.2 oz. )13.2 oz. 4 for 4 dollars and 00 cents or 1 for 1 dollars and 19 cents 4/$4.00 or 1/$1.19$0.09 / oz. 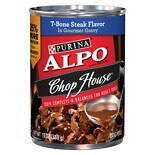 Shop Alpo Chop House Dog Food T-Bone Steak (13 oz. )13 oz. 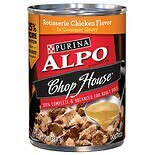 Shop Alpo Chop House Dog Food Rotisserie Chicken (13 oz. )13 oz. 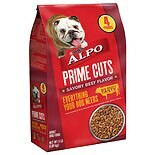 Shop Alpo Prime Cut Dog Food Savory Beef (64 oz. )64 oz. Choose Alpo dog food when you want to feed your dog a meaty meal. There are many flavors to choose from to add a welcome variety to your dog's diet. Alpo is famous for is wet canned dog food. Like people, every dog has unique tastes and preferences. When you want to feed your dog the best possible foods, consider the available Alpo dog food lines. Alpo Prime Cuts contains large chunks of meat and rich gravy to encourage your dog's appetite. There are many different flavor combinations including beef with gravy or vegetables, lamb and rice or chicken. Alpo Prime Slices contains meat slices with flavorful gravy. 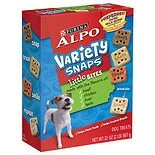 If you are serving your pet canned dog food, Alpo is sure to offer something that will tempt his appetite. Try a variety of Alpo dog food flavors with your pet until you find the ones that he enjoys. You can add texture to your dog's meal by mixing a small amount of dry dog food into your pet's bowl. Your veterinarian will advise if your dog needs a low-calorie pet food to help with weight loss. Another dry dog food option is a nutrient-rich food designed for puppies and adult dogs who need to gain weight. There are dog foods available that help you manage your pet's allergies, skin conditions and other concerns. You can create a great mixture for your dog with a mixture of both canned and dry varieties of Alpo dog food.